(left to right) Fabian Vinet; Hassans Partner Ian Felice; Linda Alvarez (Chairperson Organising Committee). The Organising Committee of the Gibraltar 2019 NatWest International Island Games is very pleased to announce Hassans International Law Firm as a Platinum Sponsor to this year’s event. Hassans are the latest in a growing list of local companies to support and partner with the Games, which will be held on the Rock from 6th to 12th July. Fabian Vinet, Head of Commercial Operations for the Gibraltar 2019 NatWest International Island Games, has warmly welcomed the announcement, saying: “As the largest law firm in Gibraltar and widely recognised as a successful, cutting-edge and internationally-focused company, it is a pleasure and privilege to have Hassans onboard. Their team have been hugely supportive and enthusiastic and this is an example of precisely the type of corporate partnership we have chosen to pursue. "The Games promise to be the biggest and best sporting event ever held in Gibraltar; a true spectacle that will show off to the 2,500 participants and other visitors not only our magnificent sporting facilities but indeed everything that this Rock of ours has to offer. "We have a great team of committed individuals working behind the scenes to guarantee the success of this summer’s event and we have the full support of Her Majesty’s Government of Gibraltar and of course NatWest International as the title sponsors, but the wider community also has a role to play if it so wishes. Speaking on behalf of Hassans International Law Firm, Managing Partner, Javier Chincotta, commented: “Hassans strongly believes in supporting the community. 2019 will see Hassans celebrate its 80th Anniversary. Throughout that time we have been fortunate to be able to sponsor a significant number and variety of causes and events both within Gibraltar and internationally. 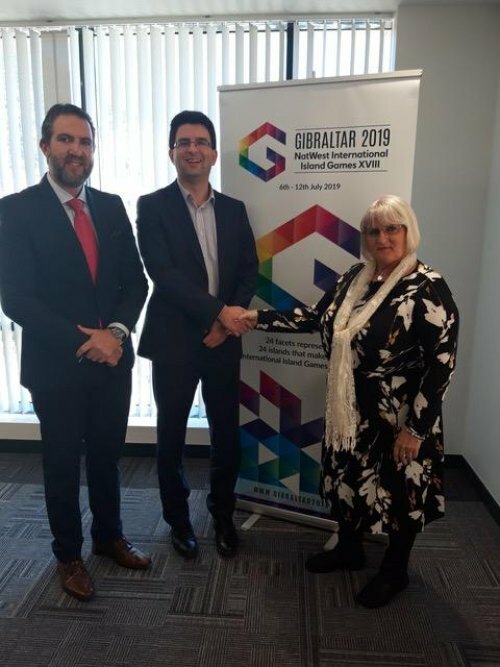 "We are extremely proud and excited to participate as a Platinum Sponsor, and partner with, the Gibraltar 2019 NatWest International Island Games. We are anticipating that many members of our staff will enjoy participating and volunteering during the course of the various events, as well as joining the wider community in attending and supporting what will no doubt be a momentous Games”.